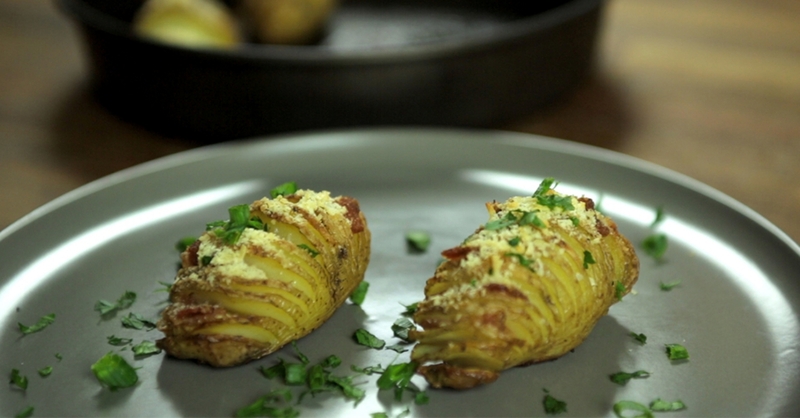 Try These Delicious Hasselback Potatoes! If you’re a fan of baked potatoes with bacon and cheese, (and who isn’t?!) this is a delicious way to jazz those babies up for company – or even just yourself! These might look upscale but they’re super easy to make, and if you’re anything like us, you’ll soon be experimenting with all sorts of yummy ingredients to stuff between those slices of buttery potato. We decided to top these ones off with parsley and chives, but feel free to add thyme or rosemary, or really any herb you like. We’re positive you’ll love this recipe as much as we did, and you’ll probably want to get creative by adding your own personal flare! You can stuff them with all sorts of ingredients: seasoned ground beef, onion, and tomatoes for taco potatoes; pepperoni, peppers, and mozzarella for pizza ones; or go classic with broccoli and cheddar! Slice potatoes almost all the way through, in 1/4 inch intervals. Tip: Insert a barbecue skewer into bottom of potato for leverage. Drizzle potatoes with half of butter (1 1/2 tablespoons), insert bacon between potato slices and season with salt, pepper and nutmeg. Bake for 40 minutes and remove from oven. Drizzle with remaining butter (1 1/2 tablespoons), and sprinkle with cheese and breadcrumbs. Garnish with parsley and chives, and serve!